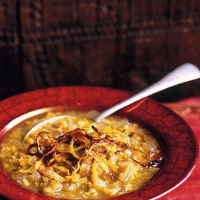 This heartwarming dish is an everyday favourite in Egypt. It’s simple to make as red lentils disintegrate by themselves. If you don’t want to garnish it with the caramelised onions, simply serve it with some tiny croutons. Chop one of the onions and slice the other. In a saucepan, fry the chopped onion in 2 tbsp olive oil until soft and just beginning to colour. Stir in the garlic, cumin and coriander; when the aroma rises, add the lentils and the stock. Bring to the boil and remove any scum that appears on the surface. Simmer for 30–40 minutes, or until the lentils have disintegrated. Warm the remaining oil in a frying pan, add the sliced onion, cover and cook over a low heat for 15–20 minutes until soft. Take off the lid, turn up the heat to medium and cook, stirring often, until dark, crisp and caramelised. Set aside. Taste and season the soup. Add water if it needs thinning down – it should be the consistency of single cream. Stir in the lemon juice before serving and garnish each bowl with some of the caramelised onions. The Corker recommends- A soft red, made from cabernet and shiraz is the kind of wine you can toss back in the quantities needed to help warming soup on its way.